View of the medieval Gambhiri River Bridge from the eastern riverbank. 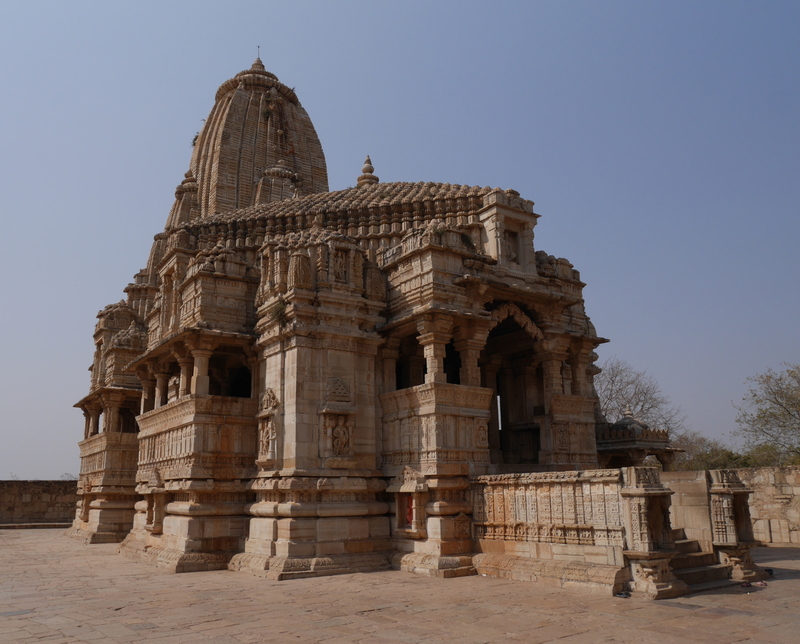 For at least a thousand years, people have been building large structures out of stone in northwestern India. 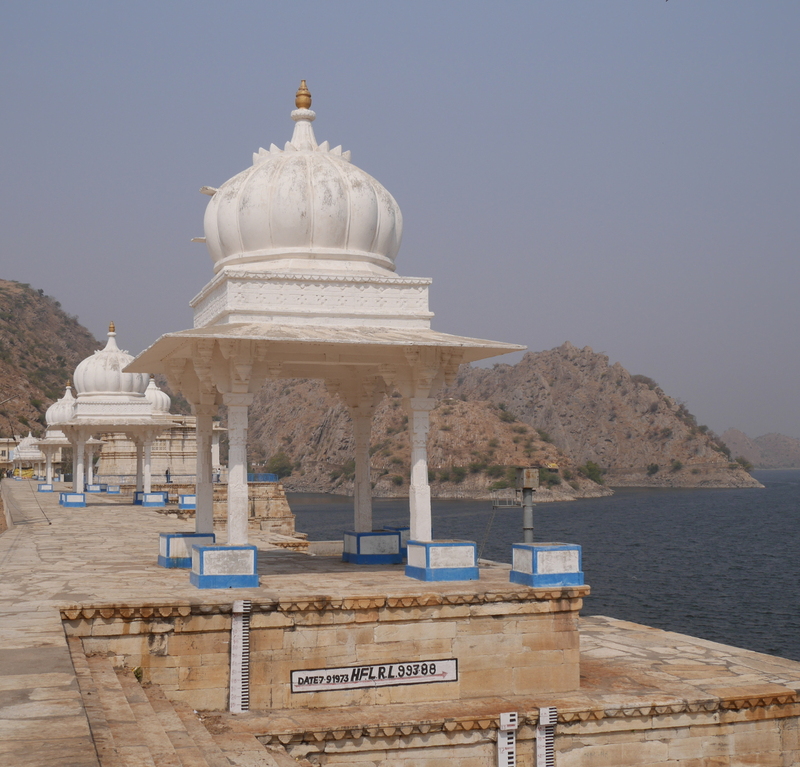 The modern Indian state of Rajasthan is full of the remains of these monuments. Most of the monuments—fortresses, palaces, tombs, cenotaphs, and the like—have no real use anymore, except maybe as tourist attractions. There are plenty of pre-modern temples still in use, although many of them have been altered beyond recognition over centuries of use. And then there are some pieces of infrastructure that, with proper maintenance, still serve their original function hundreds of years after they were built. 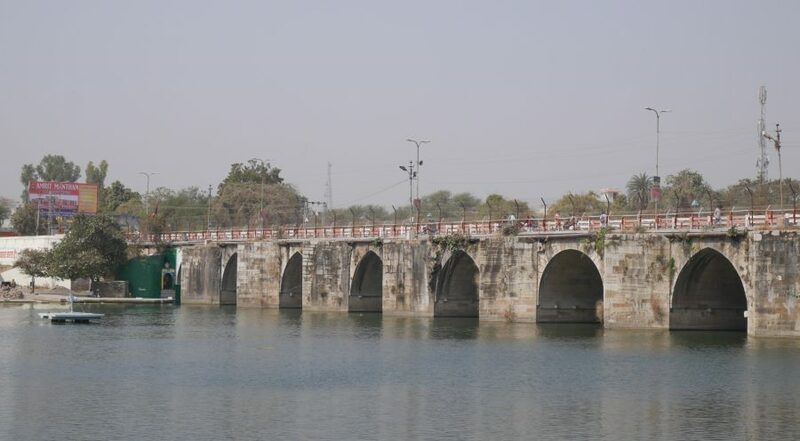 One example is a bridge over the Gambhiri River in the town of Chittaurgarh in southern Rajasthan. The bridge is located on the main road into town. It is built entirely of stone, with nine slightly-pointed arches and one semicircular arch. (The river flows through eight of the arches, while the remaining two are on the shore. There are also two additional arches on each side of the bridge, but these are made in a different style and seem to have been added later.) The piers founded in the river have triangular projections on the upstream side, to help the river water, and any debris that might be floating in it, flow smoothly around the bridge. The Gambhiri River Bridge has been modified a little over the past seven hundred years. Although it was designed for horses and carts, it is strong enough to support motor vehicles. In modern times, a three-foot railing was added to the side of the bridge; when this proved inadequate for whatever reason, an eight-foot fence was also added. The bridge also carries several pipelines and some cables. Just downstream, a newer bridge has been built for eastbound traffic. 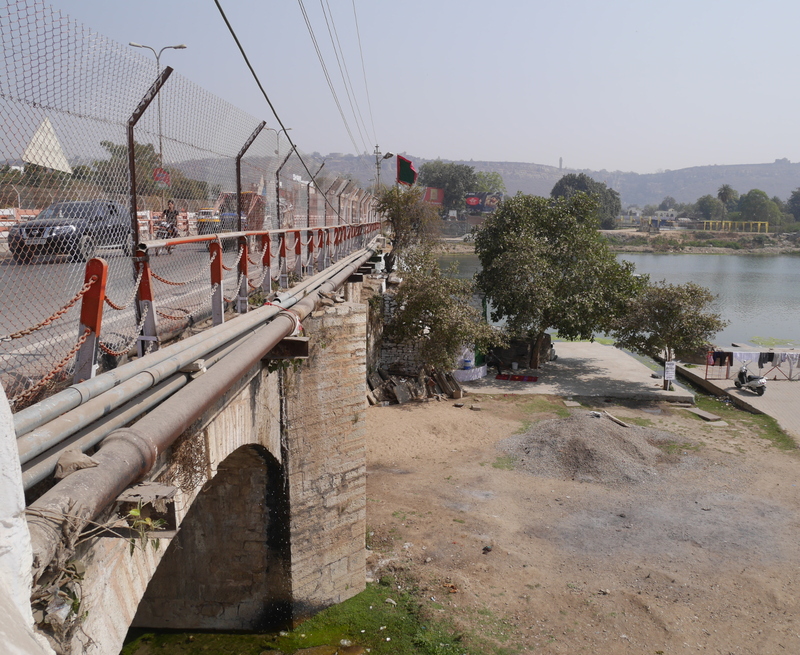 The medieval bridge now just carries westbound traffic away from Chittaurgarh. View of the Gambhiri bridge from the western bank. 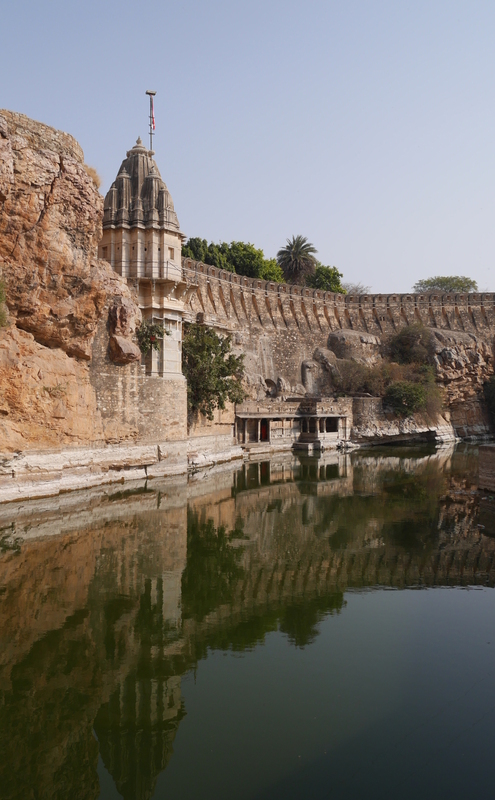 For readers who aren’t familiar with Chittaurgarh: The place is famous for the fortress by that name, a massive structure stretching five kilometers along the top of a ridge. The fortress was defensible, thanks to its position, but it was also a highly sought-after strategic prize, and it was captured and re-captured several times throughout its long history. Emperor Akbar won the fort for the Mughal Empire in a long and bloody siege in 1567-68. 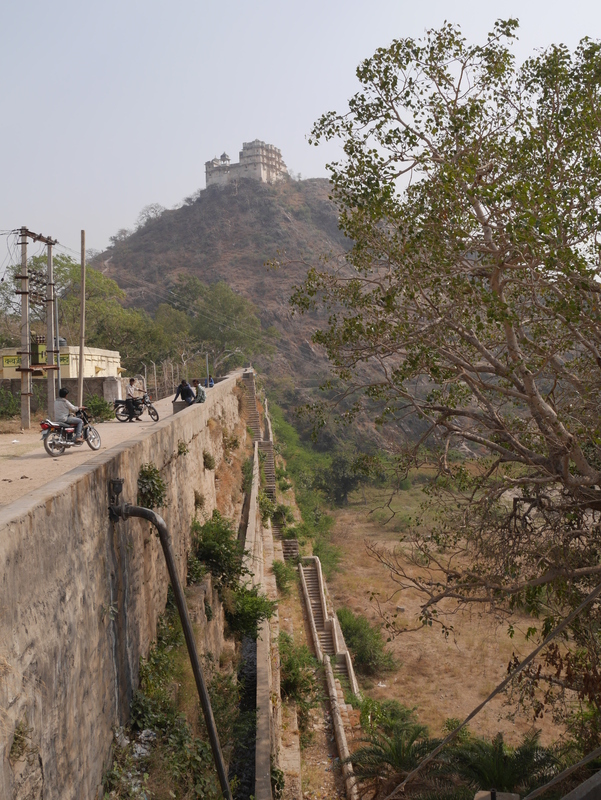 The fortress is now maintained by the Archaeological Survey of India, although it is so huge that inhabited villages exist within the walls alongside the historical monuments. 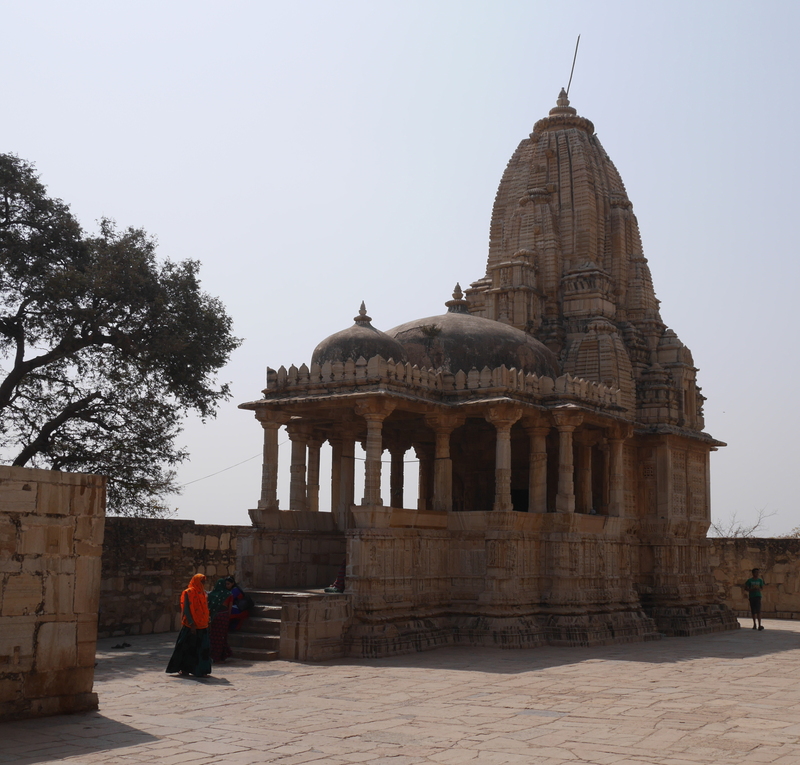 Architectural highlights inside the fort include the Vijay Stambh (Tower of Victory, 1457-68), Kumbha Shyam Mandir (magnificent Nagara-style temple), Mira Bai Mandir, and Gaumukh Kund (rainwater storage tank). 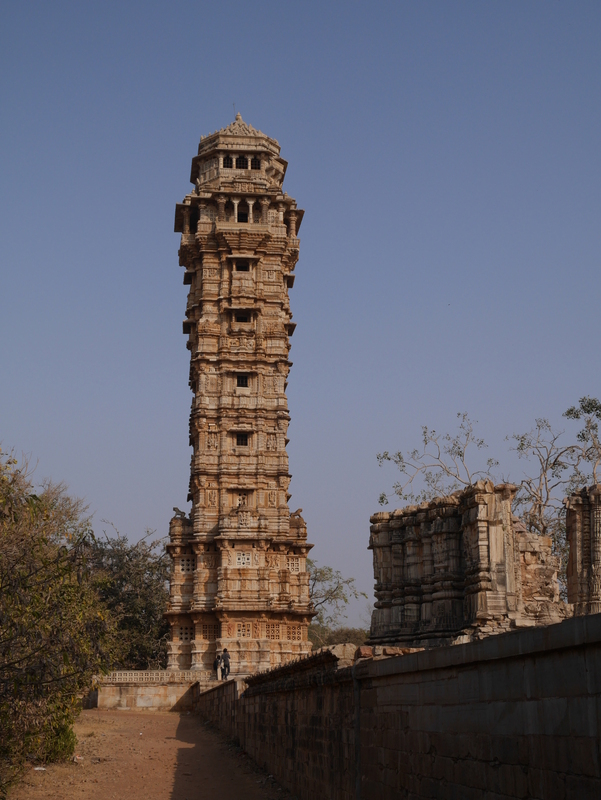 Vijay Stambh (Tower of Victory), Chittaurgarh. 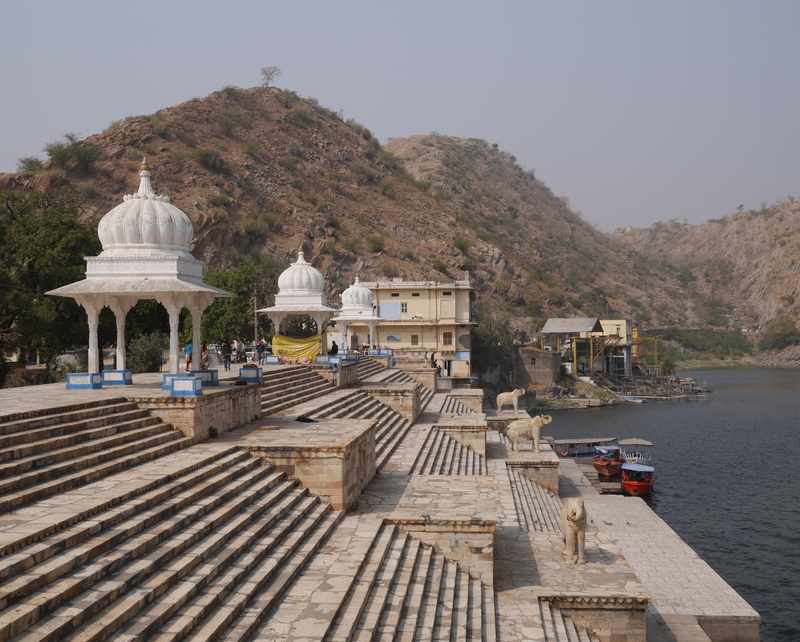 Meera Mandir, where poet-saint Meera Bai worshiped Krishna. 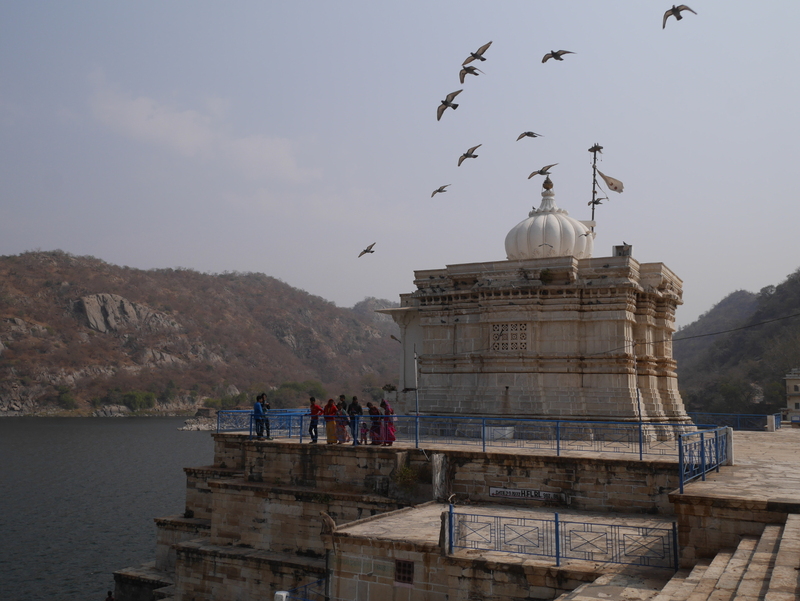 Gaumukh Kund (Cow-mouth Well), Chittaurgarh. The remains of the fortifications of Old Delhi don’t make it onto most tourists’ itineraries when they visit the city. This is understandable, because Old and New Delhi have a range of world-class tourist attractions – such as the Red Fort, Qutb Minar, and Lutyens’ Delhi – which overshadow the city walls. But as I have found on several visits to Delhi, exploring the remains of the fortifications can be a rewarding experience. From my visits to the gates and walls, I have learned about urban planning, military science from several eras, and adaptive reuse. Old Delhi was founded in 1639 by Mughal emperor Shah Jahan, who wanted to move his capital to a more suitable location than Agra, which was experiencing problems with drainage, overcrowding, and erosion. The original name of Old Delhi was Shahjahanabad, after the city’s founder. The centerpiece of Shahjahanabad was the Qila Mubarak (Blessed Fortress), now known as the Lal Qila or Red Fort. The fort stands on the eastern side of Shahjahanabad, with its back to the Yamuna River. It served as the royal palace and center of the Mughal government. To the west of the fort, an area of about 1,500 acres was enclosed by city walls built of stone rubble. The walls were broken by eight main gates and several lesser portals. The walled area of Old Delhi still retains its historic identity. It even has its own postal code, 110 006, and it is colloquially referred to as “Delhi-6.” Only fragments of the walls and four of the eight main gates remain, though. On the southern side of Old Delhi, Ajmeri Gate, Turkman Gate, and Delhi Gate still stand on little plots of land, disconnected from the historic walls and surrounded by their own fences and gates. Left to right: Ajmeri Gate, Turkman Gate, Delhi Gate. Stretching eastward from Delhi Gate are some sections of the old city wall. 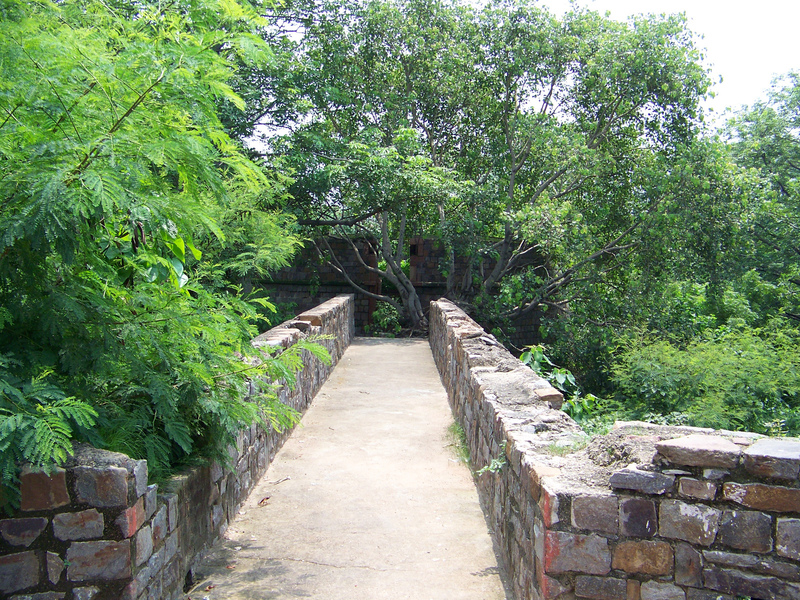 One stretch of the wall is preserved in a city park, Ekta Sthal (Place of Unity). Only the outer side of the wall is protected, though. The inner side backs up to an alley, and there are several encroachments and illegal constructions built on the historic wall. 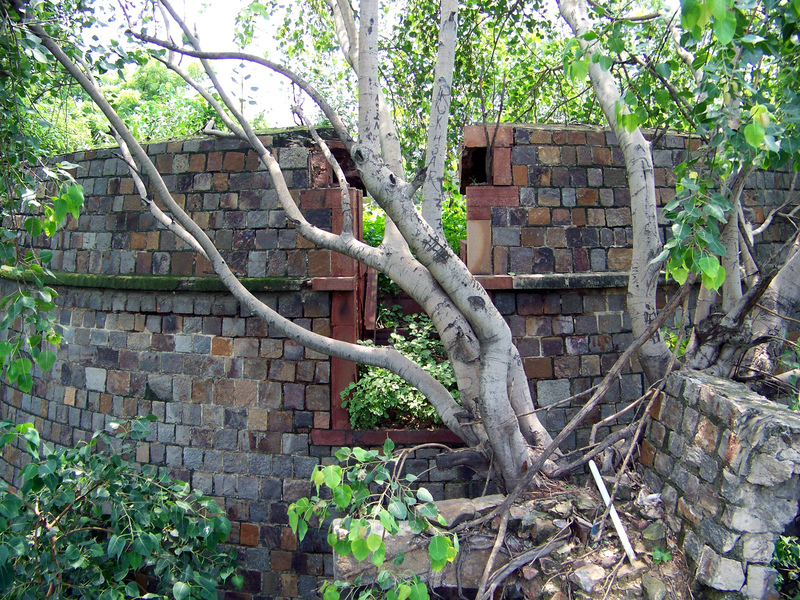 Backside of preserved wall segment in Ekta Sthal. View from ramparts of Delhi’s walls. One ramp up to the battlements hasn’t been encroached upon yet, and you can climb up and have a look around. From here you can see a round tower built in front of the wall. The tower doesn’t seem to match the style of the rest of the wall – and it shouldn’t, because it was built by the British in the nineteenth century. It is a Martello tower, designed to hold cannons and serve as an outer defensive post. The British built Martello towers all over their world empire in the nineteenth century. Northeast of Ekta Sthal and the Martello tower, sections of the city wall now serve as retaining walls beneath more modern construction. Remaining city wall serving as a retaining wall. 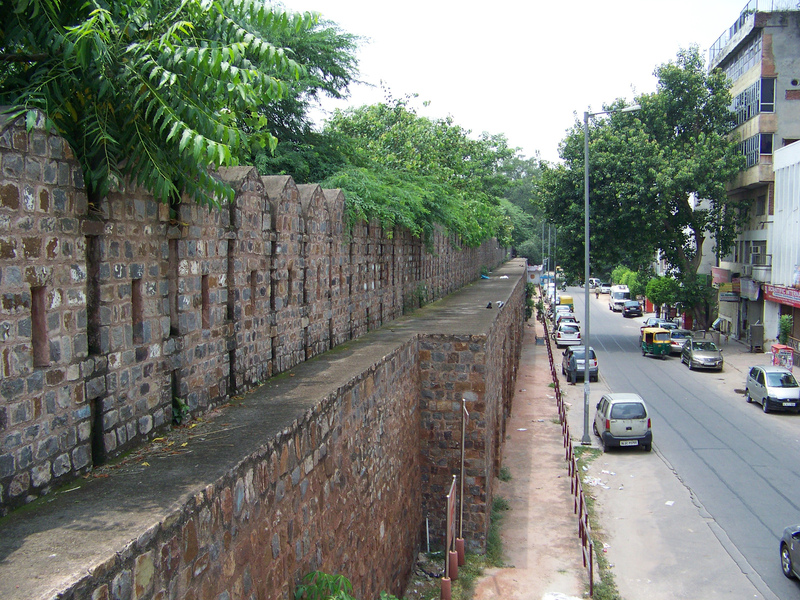 The longest stretches of surviving wall are on the north side of Shahjahanabad, around Kashmiri Gate. 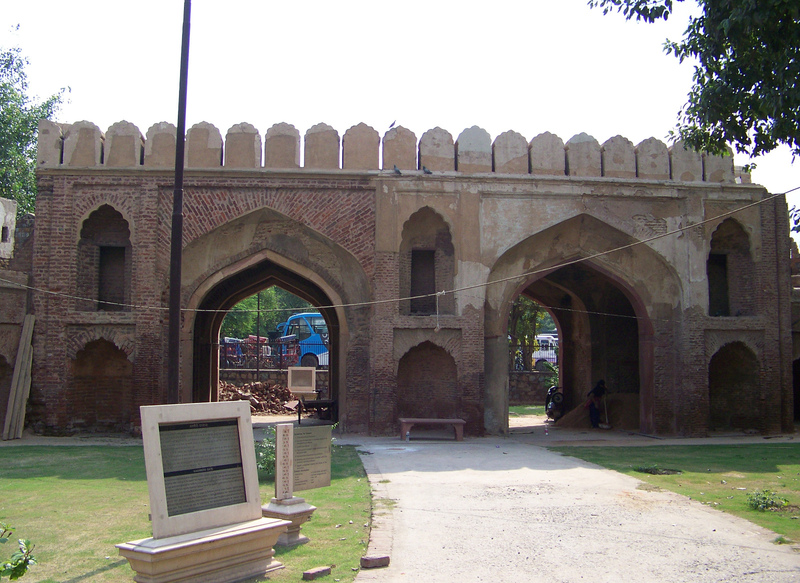 Parts of the city’s fortifications are still attached to Kashmiri Gate. Unlike Ajmeri, Turkman, and Delhi Gates, the surviving structure of Kashmiri Gate wasn’t built until the nineteenth century. The gate was constructed in 1835, and then in 1857 it was expanded to have two portals. 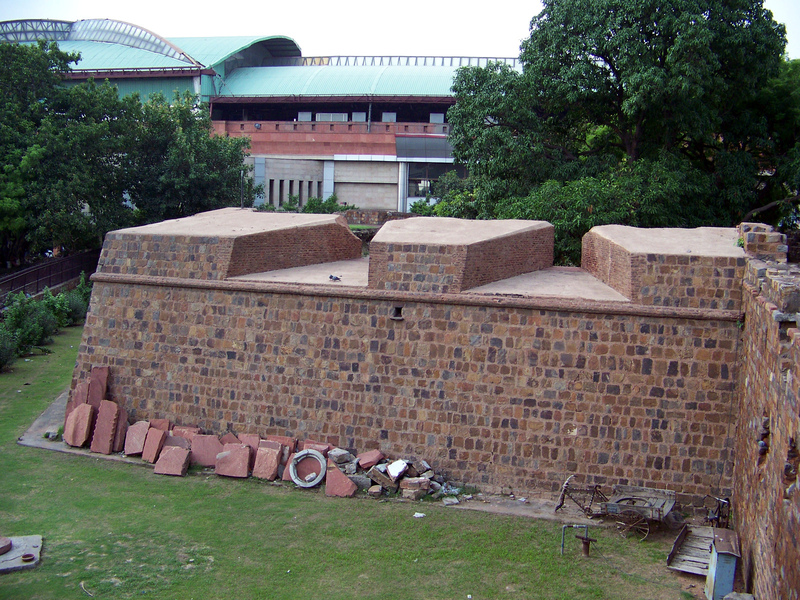 A bastion next to the gate is built in angular star-fort style, a form of construction that was introduced to India by the British. 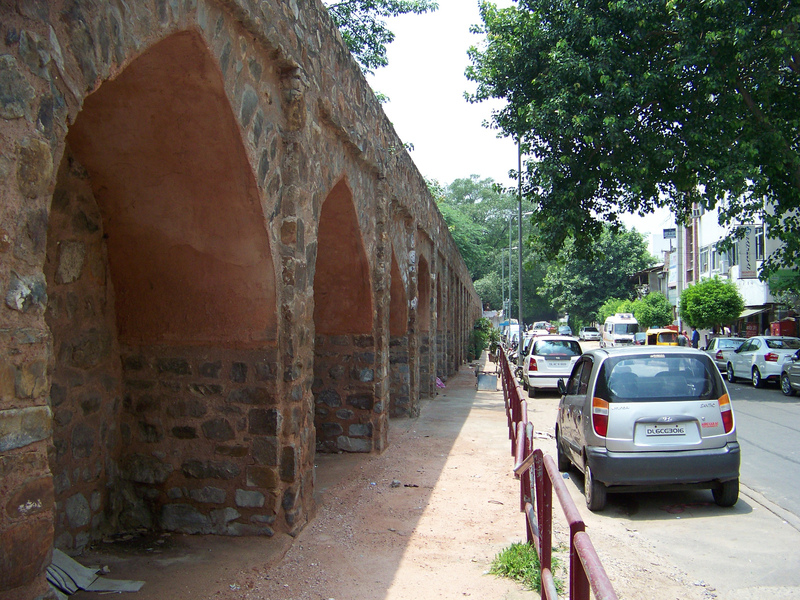 Kashmiri Gate, Delhi’s only gate with two portals. 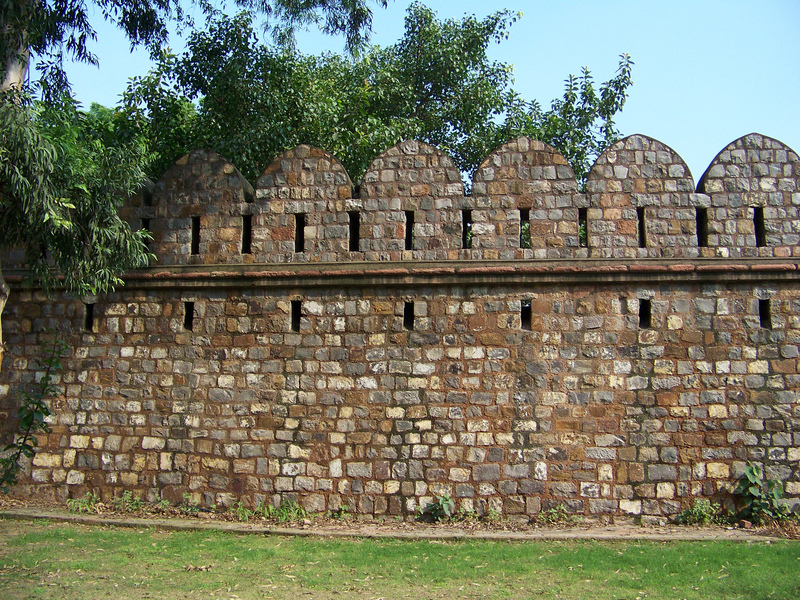 A European-style bastion next to Kashmiri Gate. Sections of city wall still stand on both the east and west sides of Kashmiri Gate. The sections on the east side are protected from encroachment by a metal fence. The sections on the west are not protected at all. Holes have been punched in the walls here and there. The arches under the battlements are used for stabling livestock and storing hay and building materials. When I visited the unprotected section of wall, I didn’t feel comfortable playing tourist and snapping picture after picture. I felt the same way that I would feel taking pictures of a stranger’s house. The walls are historic landmarks, but they are also places where some Delhiities live and work. 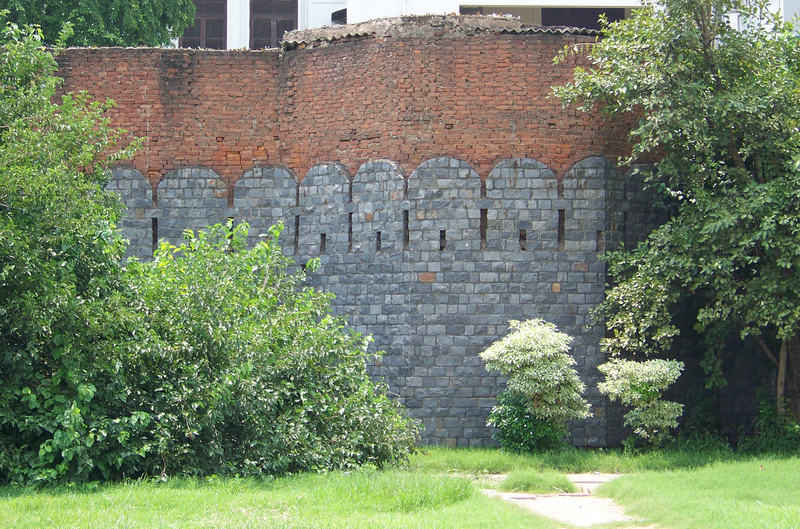 One of the preserved sections of wall near Kashmiri Gate.